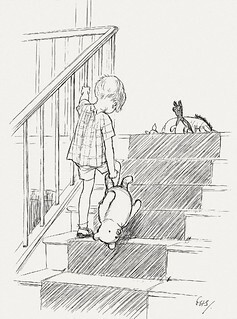 “Here is Edward Bear, coming downstairs now, bump, bump, bump, on the back of his head, behind Christopher Robin. It is, as far as he knows, the only way of coming downstairs, but sometimes he feels that there really is another way, if only he could stop bumping for a moment and think of it. And then he feels that perhaps there isn't. This is the starting point for many teams, including some self-declared agile teams. They are working hard to produce quality software, but they seem to be bumping their head on each stair on the way.